Five guitars belonging to Tom Petty and the Heartbreakers were stolen from a soundstage at The Culver Studios in Culver City, according to the bandâ€™s website. A reward of $7,500 with â€œno questions askedâ€ is being offered. 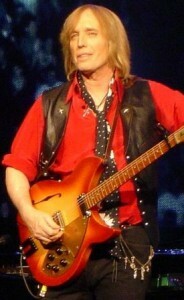 Petty had been rehearsing at the studios in advance of the band’s 2012 North America-Europe tour, which kicks off on April 18 in Broomfield, Colo. No shows have been planned for Los Angeles. The theft was reported to the Culver City Police Department on April 12 a little after 4 p.m., according to Sgt Dan Sukal. The Culver Studios, a complex of 16 soundstages just off Culver Boulevard, was the home of â€œDeal or No Deal,â€ â€œAmericaâ€™s Next Top Model,â€ and â€œThe Starter Wife.â€ Films such as â€œState of Playâ€ and â€œRush Hour 3â€ have also been filmed here. â€œCougar Town” is currently in production on the lot. The guitars include Pettyâ€™s 1967 12-string Rickenbacker and his Gibson SG TV Junior, Ron Blair’s Fender Broadcaster, Scott Thurston’s 1967 Epiphone Sheridan and Mike Campbell’s blue Dusenberg, which was built for Campbell to commemorate the band’s 30th anniversary. Fan reaction to the theft was fierce. â€œ… nothing lower in life then a thief who would steal a mans tools to feed his family,â€ wrote one. â€œI don’t normally condone acts of violence against others, but since I’m referring to nothing more than knuckle-dragging neanderthals â€“ I hope somebody beats the [expletive] out of them with their own clubs,â€ wrote another. One of Tom Petty and The Heartbreakers’ stolen vintage guitars was found in a Hollywood pawn shop after being sold to the store for $250 (Â£156). The band’s valuable instruments were stolen last week from a rehearsal space in Los Angeles, but were recovered yesterday (April 17) by police. Daryl Washington, who worked as a private security guard at Culver Studios where the band had been practising ahead of their new tour, has been arrested in conjunction with the crime. The stolen items included Petty’s 1967 12-string blonde Rickenbacker 360 and his 1965 Gibson SGTV Junior, as well as a Fender Broadcaster belonging to bassist Ron Blair, and guitars belonging to Scott Thurston and Mike Campbell. We’re relieved and extremely pleased that all of Tom Petty’s stolen guitars have been recovered and that a suspect has been arrested. Our security department cooperated fully with the Culver City Police in the effort to solve this crime. 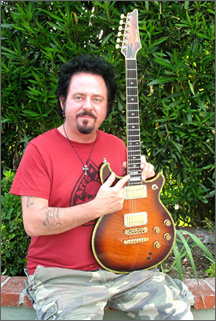 Ex Toto guitarist and all round session superstar Steve Lukather has listed a whole bunch of instruments and gear on Ebay through L.A. Vintage Gear. Included are a very cool looking Rickenbacker 6/12 string double neck and a unique 26 year old Ibanez prototype of a potential Lukather signature model that never made it into production. Bidding starts at $18,000 so start raiding your piggy banks!